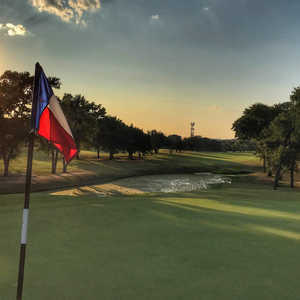 AUSTIN - Set out in the countryside east of Austin, Bluebonnet Hill is one of the more unique courses you can play in the Austin area. Not only because of its link-style setup, which is one of just a few in the area, but because of its quiet, calm backdrop. Surrounded by private property, most of which is ranchland, Bluebonnet Hill allows you to get away from the hustle and bustle of the city and truly enjoy some quiet time on the golf course. Beginning on the first tee, you get a good feel of the peaceful environment as you leave the pro shop and parking lot behind. The only sounds besides your golf cart or occasional chatting among various groups will likely come from the local natural habitat or maybe a whinnying horse here and there. Your 18-hole journey begins with a 536-yard par 5. Like many holes on the course, which was designed by Jeff Brauer and opened in May 1991, it is relatively flat and the only real trouble spot is left in the form of thick grass and brush that are out-of-bounds and can be found throughout the 6,503-yard layout. Off the tee to the right are several rolling mounds that won't result in a lost ball, but can create problems on your second shot if you get a bad lie. Several more mounds surround the back-to-front sloping Bermuda grass green. No. 1 yields many pars and can provide a good start to your day. Nos. 2 and 3 are a pair of par 4s that can play relatively easy provided you hit it straight off the tee. No. 2, a par 4 of 400 yards, is a dogleg-left that requires an accurate tee shot to the fairway avoiding the brush and tall grass to the right and left. If you can hit a solid tee shot to the right side of the fairway, the trees at the dogleg on the left side will not come into play. An errant approach to the green may find the bunker to the right. No. 3 is shorter than its predecessor measuring just 340 yards. However, don't be fooled by its short distance and downhill design. The treachery on this hole comes not off the tee, but on the approach. A pond awaits to the left of the green for any approach hit just slightly left. Stay right. After the test of No. 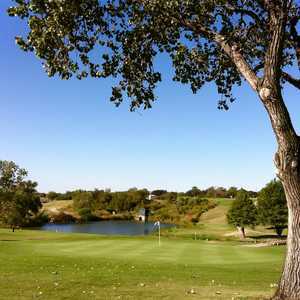 3, Bluebonnet Hill provides you with a breather over the next four holes. Each of the holes is relatively short - the exception being the par 4, 420-yard No. 8 - and features brush and strategically placed bunkers. For the most part, a straight shot off the tee will put you in good position in relation to scoring par. Any errant tee shot, including the par 3s - Nos. 4 and 6 - will likely cause your score to soar. No. 6 is one of the more deceptive holes measuring just 136 yards. This downhill hole features a pair of pot bunkers to the right and left of the green. However, once you've safely landed on the dance floor, your work is not done. The green slopes considerably from back to front and includes several rolling hills just to make your putts a little more interesting. To finish out the front side, you finish with a par 5 of 547 yards. This dogleg-left is one of the few holes on the course to feature water. (Don't worry. This lack of water is more than made up for on No. 17 alone.) After a successful shot off the tee, your second shot is downhill to the dogleg. Only a wild second shot will find the water through the trees. Your approach to the front-side finishing hole is uphill to a green surrounded by mounds and grass bunkers. The backside returns to the medium-to-short distance hole with a par-4 of 364 yards. The hole is even shorter with your first shot coming from an elevated tee box. Accuracy is at a premium on this hole with a bunker to the left, tall grass to the right, and a fairway that narrows at the bend. Play it safe and use a 5-wood or low iron off the tee and leave yourself in position for a reasonable approach to a green that is protected to the front and left by a group of cattails. After a relatively easy par 4 to start the back nine, No. 11 hits you hard and it is considered one of the most difficult holes playing straight uphill at a length of 375 yards. Trees line the right side of the fairway on this hole and several smaller trees and brush lie to the left. If you successfully manage to stay in the fairway, you hit to a green that has several bunkers to the right. If you escape with par, you've done well. No. 12 is one of the most picturesque holes at Bluebonnet Hill. This par-5, 488-yard hole is downhill to a fairway with a large pond to the left and pot bunkers on the right and left sides of the fairway. After you have successfully maneuvered around the obstacles, you must hit to a three-tiered green that is protected by a left greenside bunker. The obstacles can create problems, but overall this hole is not that difficult. According to head professional Jeff Wilson, No. 12 was designed to let the golfer regain their composure following the demanding No. 11. "After No. 11, we decided to design No. 12 so that the golfer could recover. No. 12 is easier and a good scoring hole." After a short par 3 and a long but straight par 5, you are faced with a decision on No. 15. This hard dogleg-to-the-left is a par 4 that measures a meager 317 yards off the tee. Your choices out of the box are: a) try and cut the corner hitting over brush and tall grass to the left and leave yourself with a very short approach if you clear the impending danger, or b) play it safe and follow the hole design with a straightaway tee shot. Your best bet is the latter of the two choices. If you do choose "a" and don't hit it square, your ball will be difficult to find. Several bunkers to the left protect the green. No. 16 could be considered a "tweener" hole because it's sandwiched between Nos. 15 and 17, which both require some decision-making. The par-4, 386-yard hole is rather straightforward with a tee shot to a straight fairway that runs downhill. The only real deliberation on this hole comes on your approach and is dependent on the pin placement. If the pin is to the right on this green, you will have to contend with the water protecting the front one-third of the green. If it is left, fire at the flag. No. 17, a par 3 of 195 yards is - without question - one of the most challenging holes in Central Texas. That's right, a par 3 of less than 200 yards. Two factors make this hole difficult - wind and water. First, we'll address the water. Less than 20 feet in front of the tee box, the water begins. It doesn't end until the green. Basically that means you must clear at least 180 feet of water. If the wet stuff wasn't enough, there's the wind. The wind blows predominantly out of the south on this hole, which sets up with the tee shot traveling from the northeast to the southwest. What this means to you is on most occasions the wind will tend to blow your ball back toward the water. Take an extra club or two, or three. The group I was playing with left six balls for the water gods all because they thought they could clear it with a 5-iron. Wilson, who has been the head pro at Bluebonnet Hill since its opening, said winter poses a different problem on No. 17. "In the wintertime the wind is behind you so it is hard to stop your ball on the green." Wilson said even when you have made the green on No. 17, there is still work to be done. "There are some wicked putts on this (undulating) green." The green, which slopes back to front, is consistent with the rest of the "short stuff" found throughout the course. Wilson said they pride themselves on the quality of their Tifdwarf 328 Bermuda greens. He said the greens are also known throughout the Central Texas region for that quality and their speed. "Whether you're talking about private or public, we have some of the fastest greens around." After the multiple challenges of No. 17, you finish your round with a relatively easy par 4. The 342-yard No. 18 is straight and is slightly uphill off the tee. Bunkers lie to the right and a valley, which is reachable off the tee, crosses the fairway and can create an awkward lie. A bunker to the left protects the No. 18 green. Upon the completion of your round at Bluebonnet Hill, the tranquility and speed of your round will not go unnoticed - an oxymoron to say the least. The speed of play, which allows more than 50,000 rounds to be played annually, is something that Wilson said is very important to his staff and the golfers playing. "We enforce the speed of play because we believe a morning round should finish in four hours or less and the later rounds should be around four hours and 15 minutes." 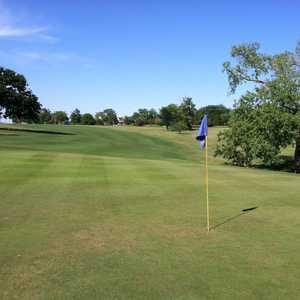 That policy, which most golfers agree with, along with the overall setting of Bluebonnet Hill, make it a good choice when you decide to hit the links in the Austin area.